The devil by the name of Karnat was erecting havoc in the area of Dharmaranya. The people of the area were fode-up because of Karnat terrorism, particularly. The Brahmin as he used to harass them in their praying. All the Brahmins got together and went to goddess Shri Mata for help and protection from the devil. After listening to problems of Brahmin the goddess got very very angry. She started throwing out fire from her mouth due to her anger from the fire a powerful goddess by name of Matangi (Modheswari) was created by Shree Mata. Matangi had eighteen arms each having a weapon like trident, Kamandal, Shell, club, Pash, dagger etc. Goddess Matangi killed devil Karnat (In another version Shyamala sister of Matangi killed Karnat) It was mahadev trij the day Karnat was killed. Brahmins of Modhera celebrated that day with a feast and accepted modheswari as their Kuldevi. Every year on the thirteen day of Maha Month Modh Brahmins celebrate as Kuldevi's day. 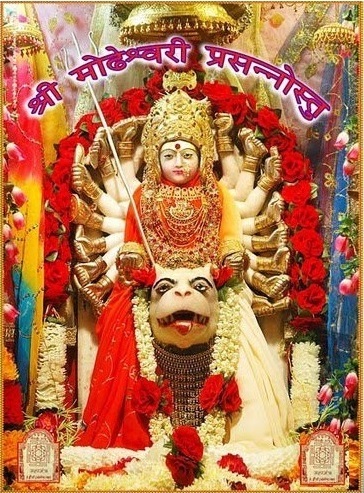 The Thirteenth day of Maha is celebrated as day of Goddess Modheswari Ma. For last sixty one years Shri Dasha Vanik Modhs and Shri Visa Vanik Modh go to Modheswari from patan and worship the goddess by chanting navchandi and Havan. They also sing ras garba. One the fourteenth day of Maha in the temple of Dharmeswar Mahadev people chant raghurudra three times a day. On the first Saturday Sunday of Phagun about 1200 Modh Chaturvedi Brahmins are coming Modhera for last thirty five years. They pray the goddess by navchandi and heist the flags on the temple. In the temple of Shiva non stop Chant of Om Namah Shivay is chanted. In the night they play garba. They also arrange marriage and thread ceremony. On the fourteenth and fifteenth day and sixteenth day of Phagun Modh Brahmins and Modh Vaniks come here from Nadiyad. For last fifty five years they come here for two three days. On the day of holi the do Havan with chanting of Navachandi. In the night they play garba and the third day they play with colors and take out the procession of goddess and go to the Surya temple at about 8 o'clock they comeback. Next day after offering their prayers and return to their homes. They celebrate Chaitra Navaratra with very enthusiasm. On the eighth day of Chaitra people chant Navchandi. The Ninth day of Chaitra that is Ramanavmi, next Shiv temple there is a temple of Rama. Ramanavmi is celebrated with enthusiasm. On fourteenth and fifteenth day of Aashad people walk dawn from patan. On the last day of Shravan they worship Dharmeswar Mahadev. In the navaratra of Aaso many people gather at the temple in huge number. On the eighth day of Aaso in the temple of goddess people chant navachandi. On the fifteenth day of every month people come here from Ahmedabad, Baroda, Mumbai, Nadiyad and various parts of saurastra etc.